I like sarcasm. By "like," I mean I communicate primarily in snark. And that's okay. So when I was first diagnosed and quipped that I should get a t-shirt or fruit basket or something, I thought it was just me being me. 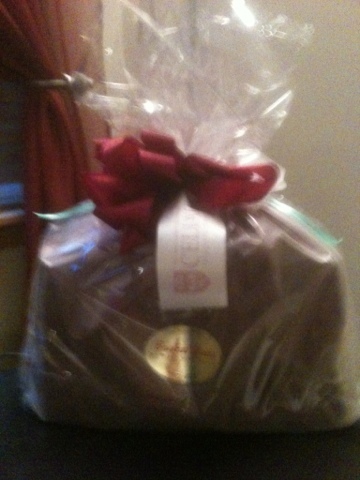 The crummy picture doesn't do this gorge basket justice. Full of delightful treats, helpful information and great coupons, this is basically a "welcome to the Celiac club" basket that the University of Chicago's Celiac Disease Center sends out to people who have been recently diagnosed (via endoscopy) with Celiac. They are able to do this through donations from companies, but also through private donations. After having a rough weekend, and getting a little drained emotionally from this journey, it was incredibly awesome to come home and see this sitting on my porch. I mean, I love freebies no matter what, but when it is a whole basket of goodies I can eat, and new products for me to explore, it was just the highlight of my week. 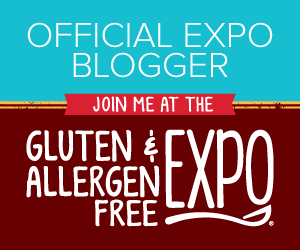 So getting on my soapbox here, it just shows why it is important to support programs like University of Chicago's Celiac Disease Center. Not only are they doing important research to find a cure, or a treatment, or a vaccine, but they are working every day to make things a little easier for people like me. Thanks, U of C, you will be getting a donation from me shortly! It's Chicago Restaurant Week time, everyone! We've been to Capital Grille's downtown location before, and while it was pricey for us as newlyweds, it was well worth every penny we spent. So when my in-laws invited us to dine with them at the suburban location, and during CRW when it was a super-cheap price fixe menu we were all over it. I had just one question - gluten? We called the restaurant to see if they were down with the celiac, and were assured they could hook us up. Well, maybe not in those exact words - they are a little classier than that. It was sort of mob scene there, even with it being Ash Wednesday, and I was glad we had reservations. Our server, Lindsay, was fabulous. She knew right away what I was talking about when I said "gluten free" and even steered me away from a salad dressing I thought would be okay because she said it wasn't GF after all. It was hard sitting there watching everyone else pillage the incredible-smelling bread basket on the table, but I just enjoyed my wine. The starters were good - I had just a field green salad with oil and vinegar, but by this time I was starving so it tasted like heaven. The real show was the main course - a filet mignon and some of the best potatoes I've ever eaten (granted, I was two glasses of white zin in by that time, so my perception might be skewed). The steak was like butter. I was so blissed-out, I completely forgot about dessert until Lindsay popped back over to get our orders. 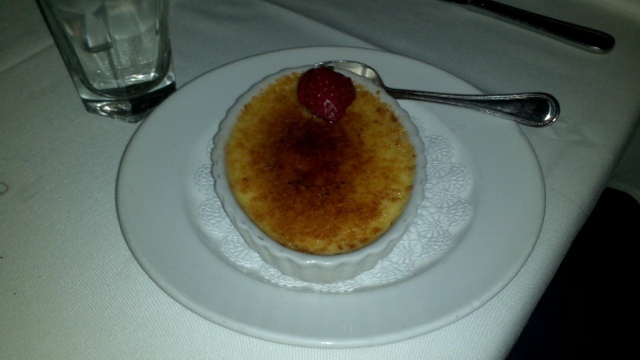 As she was listing the desserts included on the CRW menu, I stopped listening as soon as she said "creme brulee. "I couldn't possibly hope for my all-time favorite dessert to be GF. I would be totally lying if I said I didn't tear up a little at the beauty that is fancy-pants restaurant creme brulee (again, I remind you. White zin. Much of it). I would probably have cuddled it and sang it Richard Marx love songs if we weren't in a crowded restaurant. Bottom line? Capital Grille was fab as expected. Creme brulee can make me cry. And, I made it through my SECOND restaurant experience as a celiac newbie without making myself sick. Successful night all the way around. Stealing this meme from one of my besties, Kelly over at Kelly the Culinarian. Not only is she a great friend and heck of a writer, she also knows her way around a kitchen. She's also an avid runner, but I like her anyway. 1. Chicago is supposed to get hit with something called a "Saskatchewan Screamer." Apparently it's like a windy thundersnow. Sounds more like something you'd learn about on Canadiansexacts.org. Regardless, I have places to be, so it would be nice if the thundersnowing could be kept to a minimum. 2. Someone may or may not have purchased the complete series of Boy Meets World on DVD this week. Someone should probably stop looking at Amazon's deal of the day, or someone is going to have to get a second job ... but it would be worth it to relive the magic of the original TV bromance that is Corey and Shawn. 3. I am having a love affair with my new heating pad. Not in that "Saskatchewan Screamer" kind of way. But close. It's warm, snuggly and if it could somehow figure out how to let the dog out, I might marry it. We? Are restaurant people. Seriously, it feels like 90% of our social time is spent eating. Or talking about eating. Or thinking about eating. Maybe it's just 90% of my time, period. So when my friend Dave invited us out to try White Chocolate Grill, it sounded fun. They have a gluten-free menu and it is well-publicized on their Web site. Plus, Dave is a server there, and he assured me that I would be able to eat something both safe and delicious (the phrase "gluten-free gluttons" was his handiwork, too). We'd been meaning to try the place for a while, and not just to harass a friend at work. It's a classy establishment in a hoppin' location, and I've heard amazing things about the food, gluten-free or not. We decided to celebrate Fat Tuesday with dinner there with friends, and I am really glad we did. Their gluten-free menu is pretty diverse, and they take great pains to make sure cross-contamination isn't an issue. Dave told me that the cooks and servers are well-informed about Celiac and how to avoid making a customer sick, and I really appreciated that. It was nice to have him as a bit of a safety net on my first trip out as "one of THOSE people." So I made it through my first restaurant outing as a gluten-free diner, and without getting sick. Yay, White Chocolate Grill! I know. I know. WTF is a paczki? Pronounced "poonch-key", they are delightful little Polish pastries filled with an array of wonderful things. Like a jelly doughnut, but better. Much, much better. They are also a bit of a Chicago tradition - Fat Tuesday is typically paczki day in these parts, and people put orders in at bakeries weeks in advance. Usually, I am right there, ordering with them. 'Cept this year. You know. Because of the g-l-u-t-e-n. So when I was looking for an alternative that would feel like a little bit of a splurge (that I wouldn't have to make myself), I found some Udi's blueberry muffins at Whole Foods. I was skeptical, but they looked like muffins, so I grabbed them. In my house, we worship at the alter of Bob Ross. I'm not lying when I say we have about two dozen episodes of his show on the DVR. Excellent napping television, I tells you. 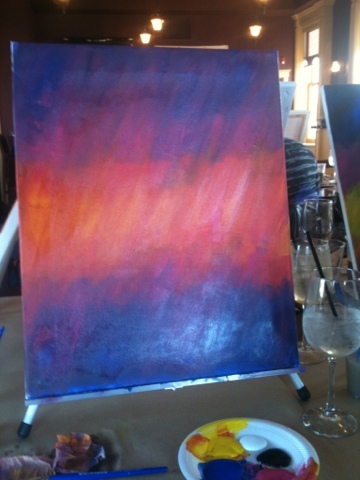 So when a Living Social deal came up to take a painting class at a wine bar, it was so on. 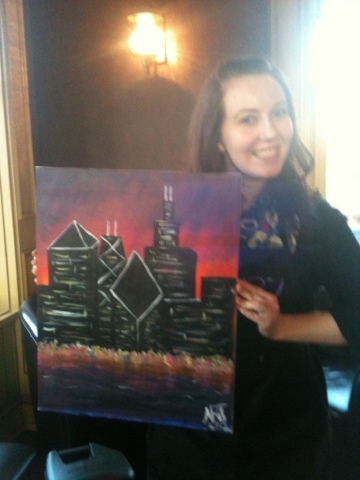 My good friend Kelly and I trekked up to the place on Sunday afternoon for what promised to be a good time. After all, there was wine! And it was cheap! 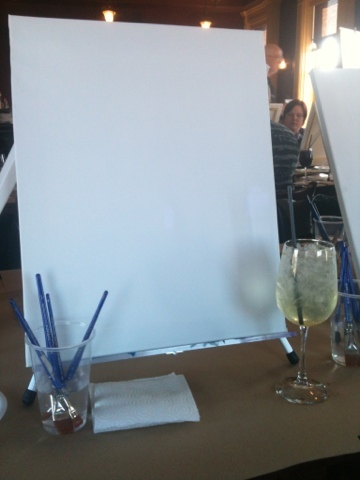 We grabbed a couple glasses of peach sangria, and settled into our chairs, with a plain, empty, white canvas staring back. 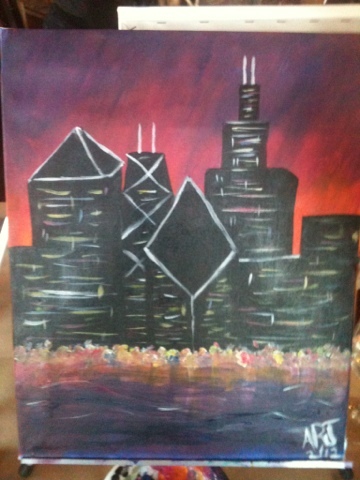 Pretty sure I won't be opening any galleries anytime soon, but it was a great afternoon. The company that runs these outings, Vino van Gogh, offers these painting classes all over the suburbs, and even if you have to pay full price for it, it's worth it for the fun afternoon and the art you can hang in your home. I always wanted to be one of those people for whom Sunday breakfast was a big, fabulous, sit-down affair. I also like to sleep in. And not cook. Which proves difficult for big, fabulous, sit-down breakfasts. 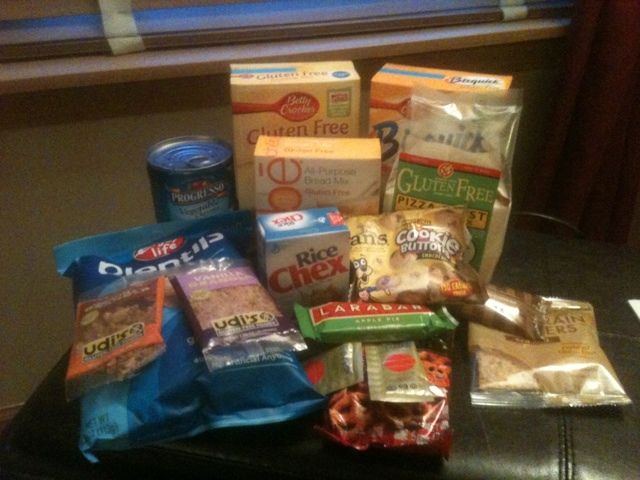 When I first got the Celiac diagnosis, I bought a few things - a new toaster, a bunch of GF snacks and cereals (yay Gorilla Munch!) and ... a waffle maker. In my house, we are collectors of useless kitchen appliances. We'll be celebrating four years of wedded bliss in June, and we've got an army of boxes in the garage holding things like mini-deep fryers, ice cream makers and a couple of things I can't identify but seemed like good ideas when we were registering at Bed, Bath and Beyond a few years ago. It is amazing the power high you get from beeping that scanner ... so even though I've wanted a waffle maker for ages, I figured it would be like everything else that seemed like a grand plan and instead is covered in dust and spiderwebs. But then I bought one. And I lurrrrves it. 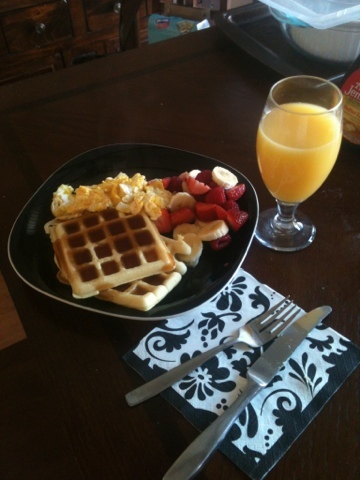 So, Sunday morning, Luke and I attempted to make a *REAL* breakfast. From scratch (Bisquick GF counts, I still had to mix it up). Since I am dairy-free right now, we subbed in vanilla almond milk for cow's milk, but other than that, we just followed the directions on the box. 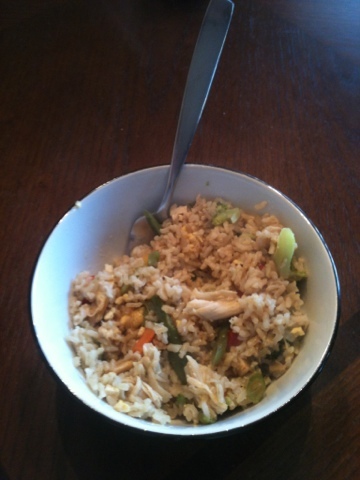 It was fairly easy, and pretty yummy. I also made a fruit salad, while Luke whipped up some scrambled eggs (this boy can cook eggs) and bacon (thank GOD bacon is GF!). The finished product was just about as yummy as anything I've ever had in a restaurant, and it was sort of empowering to do it all at home. Yay us! I'm not really a crier. I am more likely to get angry than sad - really, it's just sappy commercials and children's books about dead dogs that get me all choked up. So it is a little disarming that I have burst into tears at a local grocer at least three times in the past few weeks. Guess that just goes along with the new territory. You really don't realize the sacrifices you have to make as a Celiac until you are blindly stumbling through the cereal aisle. The title of this blog was meant to be a snarky dig at the fact that I will have to give up some of my favorite things - kids' breakfast cereals - or substitute them with more adult, less fun options. But it makes me really sad that there will be no more Captain Crunch, or Count Chocula, or Marshmallow Mateys. They were so ingrained in my existence that it truly feels like losing a friend. Which really makes you think about the way our society views food. It also makes me well aware that this process is going to be more challenging than I originally thought. The doc said there is a period of mourning for your old life, your old food, and that it is okay to feel sad. I might shed a few tears, but if you see me trying to find a cereal box-sized casket or donning head-to-toe black lace, intervene, would ya? Me: Hey, can I have a back rub. I can't eat gluten, you know. Luke (after a moment's hesitation): Sure, but I'm tired, so it will be barley a back rub. Me: Wheat do you mean? Come on. Please? Luke: Fine. I guess I am a gluten for punishment. The last thing I wanted to think about this Valentine's Day was all the delicious stuff I couldn't have anymore. 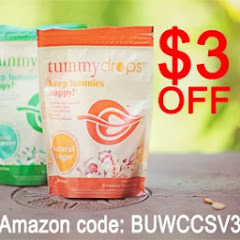 As someone who used to consider three cookies and a glass of milk a well-rounded meal, I had a really hard time accepting that I would not be noshing on the delicious treats at work, or my mom's brownies, or even one of those yummy strawberry and whipped cream cakes from a grocery store bakery. I was pretty psyched. Turns out, there are several entirely gluten-free bakeries in the greater Chicagoland area. These babies came from a Hinsdale place, Sweet Ali's. Not only are they gorgeous, but absolutely delicious, too. I would have never guessed they were GF. 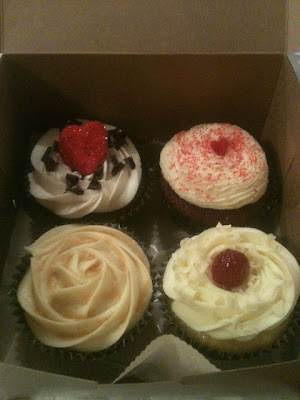 The flavors were amazing (from top left, clockwise: chocolate with vanilla icing, red velvet, white chocolate, and my fave, salted caramel), and they were moist and sweet and just completely heavenly. Apparently, the bakery has an array of items, not just cupcakes - you can bet that I will be visiting them myself in the near future to live in their kitchen partake of their other offerings. Thanks, Sweet Ali's (and wonderful husband), for making this V-Day a little less sucktastic.